So your tired of looking at those rusted Steel Baseboard Heating Element Covers and want to do something about it. 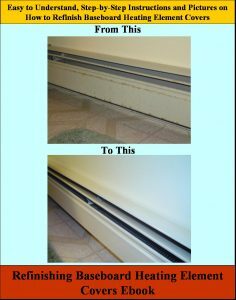 The Refinishing Baseboard Heating Element Cover Ebook from HomeAdditionPlus.com will help you restore them to a like new condition with simple to follow and easy-to-use instructions! Pictures are included for each key step in the process! Order Now and Immediately Download the Refinishing Baseboard Heating Element Cover EBook today! The Refinishing Baseboard Heating Element Cover EBook costs only $15 and is 100% guaranteed. Reinstalling the front panel covers to the Baseboard Heating Element.